When you go to a Buddhist temple, you may encounter people chanting. All schools of Buddhism have some chanted liturgy, although the content of the chants varies widely. The practice may make newcomers uncomfortable. We may come from a religious tradition in which a standard text is recited or sung during a worship service, but we don't often chant. Further, in the West many of us have come to think of liturgy as a pointless vestige of an earlier, more superstitious, time. If you observe a Buddhist chanting service, you may see people bow or play gongs and drums. Priests may make offerings of incense, food, and flowers to a figure on an altar. The chanting may be in a foreign language, even when everyone attending speaks English. That can seem very strange if you are under the understanding that Buddhism is a nontheistic religious practice. A chanting service can appear to be just as theistic as a Catholic mass unless you understand the practice. However, once you understand what's going on, you come to see that Buddhist liturgies are not intended to worship a god but to help us realize enlightenment. In Buddhism, enlightenment (bodhi) is defined as awakening from one's delusions—especially the delusions of the ego and a separate self. This awakening is not intellectual, but rather a change in how we experience and perceive. Chanting is a method of cultivating mindfulness, a tool for helping you wake up. The chant can be a mantra—a short sequence of words or syllables, often chanted repetitively, thought to have transformative power. An example of a mantra is om mani padme hum, which is associated with Tibetan Buddhism. Chanting a mantra mindfully can be a form of meditation. A dharani is something like a mantra, although usually longer. Dharanis are said to contain the essence of a teaching, and repetitive chanting of a dharani may evoke some beneficial power, such as protection or healing. Chanting a dharani also subtly affects the mind of the chanter. Dharanis usually are chanted in Sanskrit (or some approximation of what Sanskrit sounds like). Sometimes the syllables have no definite meaning; it's the sound that matters. A gatha is a short verse to be chanted, sung, or recited. In the West, gathas often have been translated into the language of the chanters. Unlike mantras and dharanis, what gathas say is more important than what they sound like. Some chants are exclusive to particular schools of Buddhism. The Nianfo (Chinese) or Nembutsu (Japanese) is the practice of chanting the name of Amitabha Buddha, a practice found only in the several Pure Land forms of Buddhism. Nichiren Buddhism is associated with the Daimoku, Nam Myoho Renge Kyo, which is an expression of faith in the Lotus Sutra. Nichiren Buddhists also chant Gongyo, consisting of passages from the Lotus Sutra, as part of their daily formal liturgy. If you are new to Buddhism, the best advice is to listen carefully to what everyone around you is doing and do that. Pitch your voice to be in unison with most of the other chanters (no group is every completely in unison), copy the volume of the people around you and start chanting. Chanting as part of a group service is something you are all doing together, so don't just listen to yourself chant. Listen to everyone at once. Be part of one big voice. You will likely be given the written-out text of the chanting liturgy, with foreign words in English transliteration. (If not, then listen until you catch on.) Treat your chanting book respectfully. Be mindful of how other people are holding their chanting books, and try to copy them. 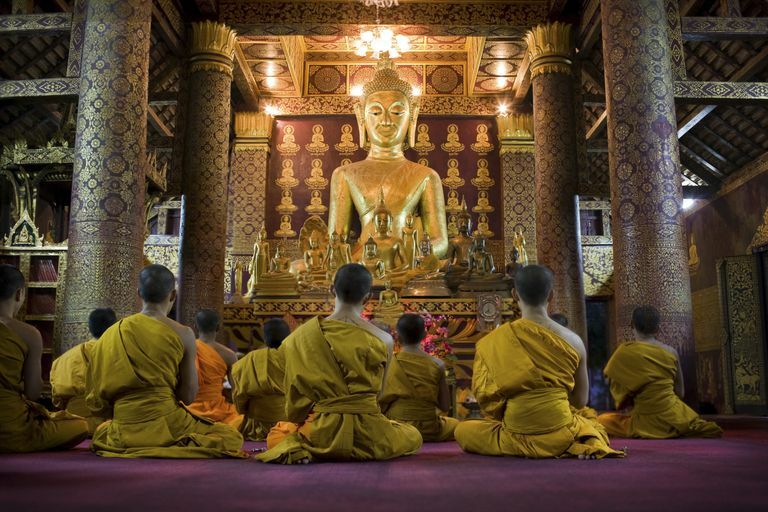 As Buddhism moves West, some of the traditional liturgies are being chanted in English or other European languages. But you may find a substantial amount of liturgy is still chanted in an Asian language, even by non-ethnic Asian westerners who don't speak the Asian language. Why is that? For mantras and dharanis, the sound of the chant is as important, sometimes more important, than the meanings. In some traditions, the sounds are said to be manifestations of the true nature of reality. When chanted with great focus and mindfulness, mantras and dharanis can become a powerful group meditation. Sutras are another matter, and sometimes the question of whether to chant a translation or not causes some contention. Chanting a sutra in our own language helps us internalize its teaching in a way mere reading cannot. But some groups prefer to use Asian languages, partly for the effect of the sound and partly to maintain a bond with dharma brothers and sisters around the world. If chanting at first seems meaningless to you, keep an open mind toward doors that may open. Many senior students and teachers say that the thing they found most tedious and foolish when they first began to practice was the very thing that triggered their first awakening experience.